Heat oven to 350°F. Grease bottom only of 8x4-inch loaf pan with shortening; lightly flour (or spray bottom of pan with baking spray with flour). In large bowl, beat eggs and brown sugar with electric mixer on medium speed until creamy. Beat in oil, milk and vanilla. On low speed, beat in flour, baking powder, ginger and salt until smooth. Stir in carrots and nuts. Spread in pan. Bake 50 to 60 minutes or until toothpick inserted in center comes out clean. Cool in pan 10 minutes; remove from pan to cooling rack. Cool completely, about 2 hours. 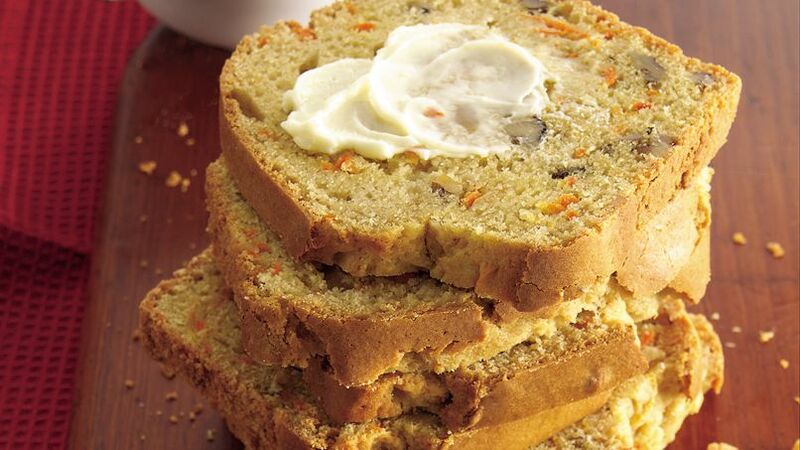 Serve slices of this fragrant loaf with whipped cream cheese. The reason only the bottom of the pan is greased is to keep the loaf from sinking around the edges.